And so yesterday, I buffered myself with paracetamol and made Rose Levy Beranbaum’s Sour Cream Coffee Cake. With apples. And no coffee (it’s taken me a while to come to terms with this apparent misnomer, but I think I understand it now – it’s a cake to eat with coffee and not a cake made with coffee). My stroppy-but-gorgeous 2 1/2 year-old finally broke her sickness-induced fast to try some of this cake today when I took it to friends’ for dinner … and then she ate a second slice when we arrived home this afternoon. So far, I have only tried a thin sliver, but there’s a larger slice remaining for me if I feel any better tomorrow. And oh – it apparently pairs beautifully with a large dollop of Tate and Lyle’s Golden Syrup ice-cream (but there isn’t any of that left now, so I’m unable to comment!). Just seen your cake, Kate, and it looks very good! I have been extremely busy over the Easter holiday as my daughter and her family have been up from Ottery-St-Mary, in fact they left about an hour ago! My son was also up from Bath for a couple of days too so you can imagine how busy I’ve been in the kitchen! Sorry to hear you’ve not been well, I hope you get over it quite soon. Melinda and I are going on a bread-baking course in May so that would probably be the best time to meet up with you as it is quite a journey for me from N.Wales, the course is in Bath so it is on my way down. I think Melinda will e-mail you with the dates and details or I will. Best regards, Jeannette. 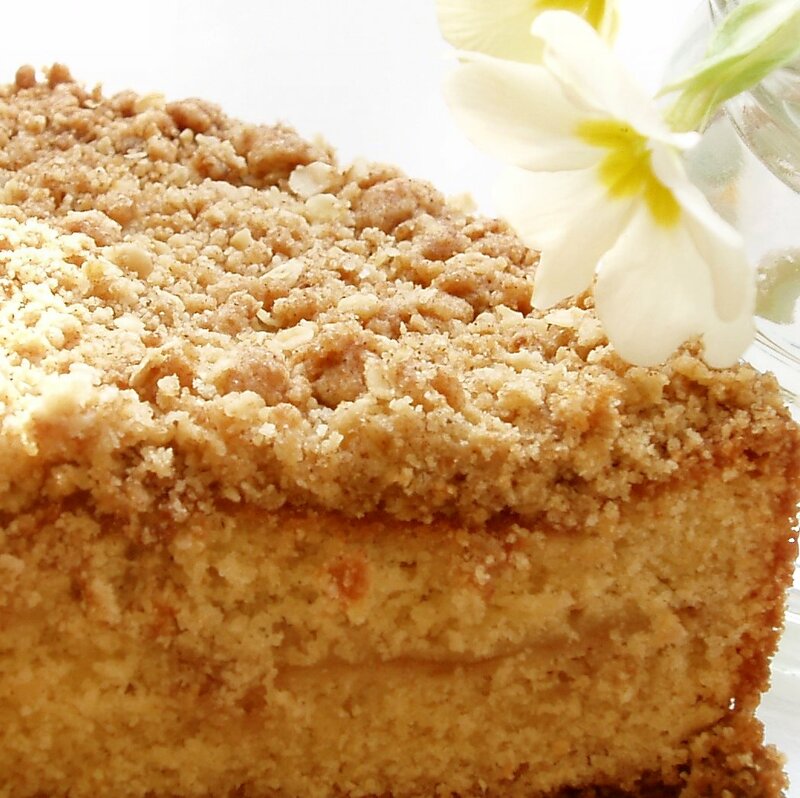 I have made this RLB sour cream coffee cake too. Delicious, as also endorsed by your recovering toddler! Did you ‘Kate flour’ the flour? I did. Jeannette and I will be in Bath the 8th of May on a croissant course with Richard Bertinet. Oui, name droppping! Aren’t we cool? Hope we can arrange to see you then? Email me to let me know.